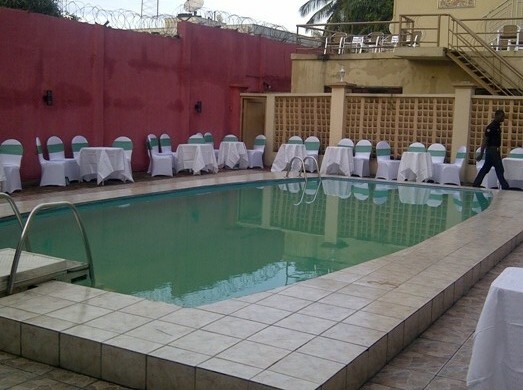 The footballer's luxury suites is situated on Waziri Ibrahim street, Victoria Island. For those of you coming home for xmas, this is the place to stay. I've been there, it's safe, it's clean, very affordable, service there is impeccable, staff very polite and helpful. There's even a night club there to have fun with family and friends. It's home away from home. Wow!!!!!!!!!! !Kanu is a wise man. What a good investment. Looks very good. However, the taste of the pudding is in the eating. i likes i like...........linda biko how affordable......you mentioned having lodged there. whats their costing like. i dont want to be caught off guard.....lol. i love the family home setting that it has. specially the sitting room n bedroom. Nice job kanu. ure a wise man indeed! Wow This Hardley Apartments Is Exotic! They are nice but can they really protect from armed robbery i doubt it in this naija wey we dey so. 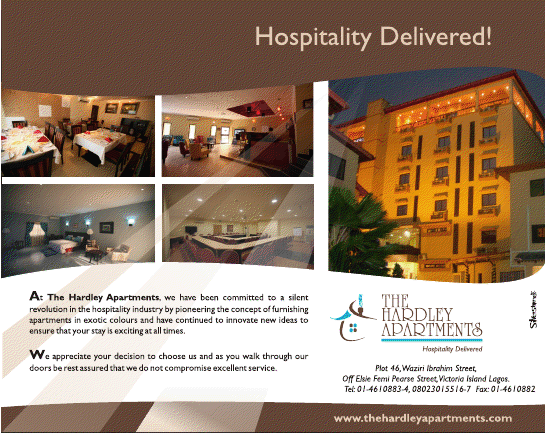 I have stayed at Hadley suites a couple of times and i agree with Linda. Services are impeccable, i even tried to order for some strange stuff on their menu,the kitchen said 20mins, i got the food in 20mins plus they have nice desserts. Okay i have said my own but its not free (Oya, 50% discount on my next stay). ‎'Even buying a girl you have just met a recharge card for as low as two hundred naira will have her in your bed in five seconds...!' Quote from the new CHARLES NOVIA movie, 'ALAN POZA' Starring O.C Ukeje, Beverly Naya, Okey Uzeashi, Evaezi, Terry tha Rapman and Norbert Young. Watch out! Is the second photo of a football field? Kanu is d only naija footballer dat has d best investment here in his home land. Pls u do wel. Atleast in a way he has created jod oppotunity 4 our youths. Not al dis greedy politicians wey dey thief our moni stil no gud investment. Kano u do wel bt u 4 oda make dem give me 1 nite naa. Lol. Kanu u try, atleast work go dey 4 our youths. Make God bless u.
Linda biz wman. Advert for kanu, kanu must pay o.
W.O.W.,that's all I can say...It's above standard if there's any like that....and if it is affordable and secured nko,"puem",like Uncle Ben will say! I love he color,the cosy environment,Kanu really is a man with a good heart...love it ,no other word to plain it,God bless Kano Nwanko! i'd love to be here with my hubby..just a weekend get-away! Trust me, Linda don package her self...ole! That's a masterpiece from our own Papilo.In fact I admire his entrepreneural sense.It's wow...!John Kalis(a.k.a Rejiggy). Nice but the bathroom looks cheap and the pool area is a total disaster! Mmmmmmh, linda, na who carry you go dia? Mind yaself! The place fine sha. The place is beautiful and very affordable. I've had dinner there a couple of times. Linda, how much do they cost, since you've been there before? abeg, how much is 'affordable price'? "This website requires Adobe Flash Player to be installed on your PC. Click here to download and install the Flash Player in order to view our website. © Copyright 2005-2011. The Hardley Apartments . Webmail . Valid XHTML 1.0 . CSS"
A flash only site is not good for any website because it limits traffic and cuts out the iPhone, iPad and other handheld devices users. Razz to the nth degree! Jacuzzi shower curtain? ok linda i see ur in the habit of not posting people's comment maybe u think its easy to sit down behind the computer to tye comments.....u had better produce my comment oo or else what happened in 1979 would repeat itself! all na yarns sha but linda stop swallowing my comments.! All of una wey don lodge there, lunch there or lay there.....why any of una no get idea of the price? Am very happy with Kanu, he is a roll model indeed.I want to say that i am tapping into this blessings in Jesus Name(Amen).May God continue to project you and you business to the next level.God bless you and proud of and you are a true Nigerian. Linda pls post the website so we can make enquiries. Thanks for the information. Linda, na which man carry you go there? Wrong floor tiles around swimming pool ... slip hazard!!!! Kanu should stick to soccer. work? I've absolutely no understanding of coding but I was hoping to start my own blog soon. Anyhow, should you have any recommendations or techniques for new blog owners please share. I know this is off topic however I just had to ask. Kudos!